Ok, I know I’ve said this before but seriously.. where on earth have these last 2 weeks gone?!? I’ve been uber busy family time, a super fun weekend watching some amazing skating and that little thing called work. Time flies when you’re having fun indeed! Anyways, it’s another ScrapMuch? Sketch-y Friday and Team A is up with their reveals this week! 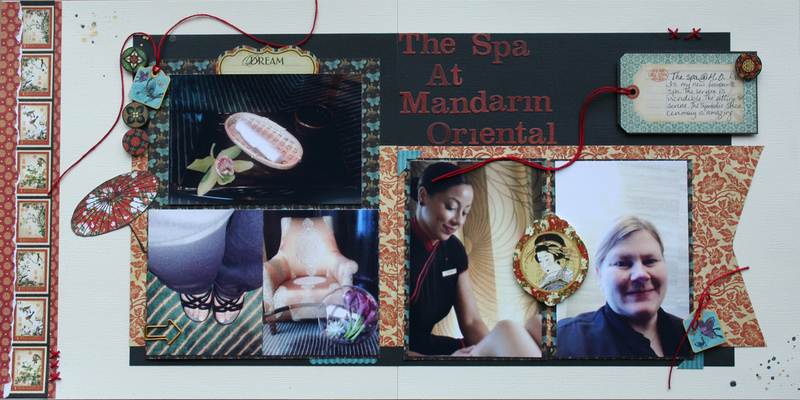 Today I’m sharing another layout with pictures from my last Vegas trip. I’m not sure how I feel about this layout because it’s a lot busier than I normally create. I actually have added a few extra sequins since I uploaded this layout to ScrapMuch? to give it a bit more of a traditional “me” feel and I’m still not sure; but to me it helped. And here are some detail shots (yes, really!). I made 2 of my own embellishments using an old technique with Tim Holtz Fragments, Glossy Accents and good quality patterned paper. You can see the first Fragment embellishment in the cluster in the first detail shot. 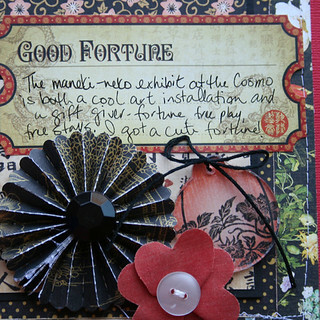 The other is at the top left of the page in the other embellishment cluster. 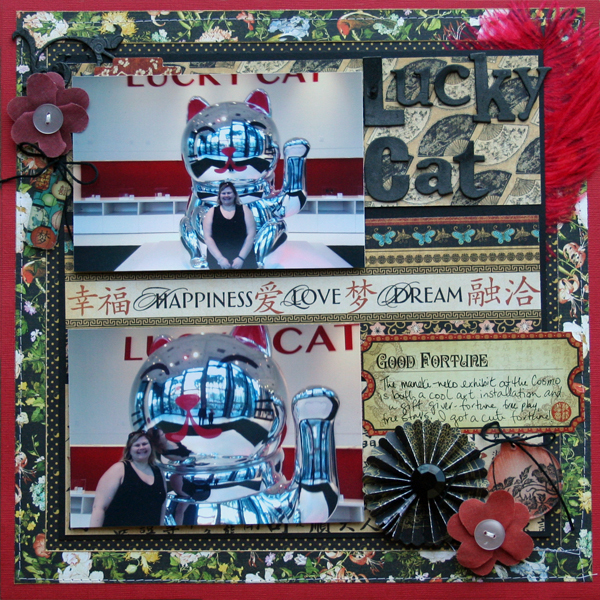 The Lucky Cat is a new art installation at the Cosmopolitan and I wanted to make sure I got a visit and a picture in before I left. Thankfully I had just enough time before seeing Jeff Dunham on my last night. 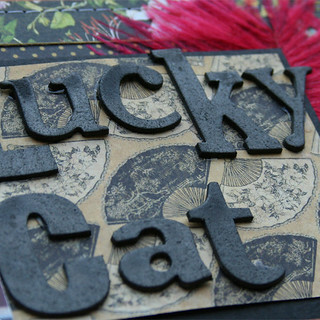 The way it works with Lucky Cat is you press her raised paw and she will give you either a fortune, some free plays at the casino, or reportedly even a free stay at the Cosmopolitan. I got a very cute fortune wishing me a good night that night, and a good life. I’ll take it. And I had a great night that night. Here is our inspiration sketch. As you can see I took a little bit of liberty with it to make it work with the pictures. So now it’s your turn! Hop on over to the ScrapMuch? blog and see what the rest of Team A has created. Incidentally this is the last reveal for the current Team A as it exists. The Design Team call is over and the announcement will be made very soon. One thing is for sure, there will be some new faces on both teams! So make sure you visit and leave them some blog love! 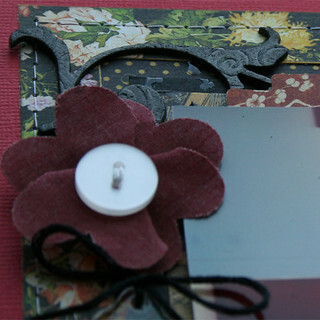 And as always, make sure you create your own layouts to share with us in the link-up for a chance to win a ScrapMuch? prize! Have a wonderful weekend! I know I’ll be scrapbooking!